This article first appeared at American Lens News on November 18, 2016. EXCLUSIVE – Durham, NC– North Carolina’s election chaos might have a new component: voter residency. The state has been plagued with allegations of fraudulent absentee ballots and other voting irregularities. As of this article, election protests have been filed 50 counties across the state. While investigations will likely follow those protest filings, American Lens has been conducting our own independent analysis of the state’s elections data and we were surprised to see a strange pattern evolve. We discovered that perhaps thousands of ballots across the state were potentially submitted in error. At issue is the determination of a voter’s residence. According to North Carolina law, The Board of Election is required to verify the validity of the applicant’s residence (§163a-842). In most cases, there is an assumption that the residence is valid, however, a cursory check of the data in Durham County should have raised a flag of concern. As seen in the snapshot below of our data analysis, it is clear that hundreds of people are listed at the exact same address at Duke University’s campus in Durham. A screen Capture of our independent Voter Data Analysis from the 2016 NC Elections database. Note that the names were distorted to protect privacy of the individual. However, all NC elections and voter information is made available under North Carolina law through the NC State Board of Elections data portal. We then looked at online mapping sites, such as Google Maps and Bing Maps to understand why so many people were listed at the exact same address. Was this a dorm? Perhaps. We went to the Duke University Police Department to see if they could aid in verifying the address. Although friendly, none of the employees or officers would go on camera, nor would they provide an official statement. However, two police officers were interviewed in the department’s parking lot under the condition of anonymity and said that they had never heard of the address. Upon their recommendation, we decided to go and check for ourselves. We then drove along Duke University Drive and followed the directions from our GPS App to its true location. Again, no such address was located. However, we did find a gravel parking lot that had about 20 cars in it and a shed. Voter eligibility is central to the determination on weather hundreds, if not thousands of voters across the state were even eligible to cast a ballot. The voter residency section of the North Carolina voting law was last revised in 1993 under House Bill 1776. At that time, Jim Hunt was the Governor, Dan Blue, Jr. was the NC Speaker of the House and Dennis Wicker was Senate Pro Tem (and Roy Cooper was a member of the Senate). There has been little consternation about this provision since then. However, this was not an ordinary election cycle. In the race between North Carolina Governor Pat McCrory and the State Attorney General Roy Cooper, evidence is mounting showing just how complicated elections can be when determining which votes are counted and which are not. According to North Carolina General Statute (*See Editors Note), the definition of “residence” contains a provision that one’s voter residency at the time of registration should be where one sleeps. But are people following the law? We believe that the majority are. However, in the case of these voters, it it is less certain. Additionally, we did a quick check on 30 names on the list through Social Media. 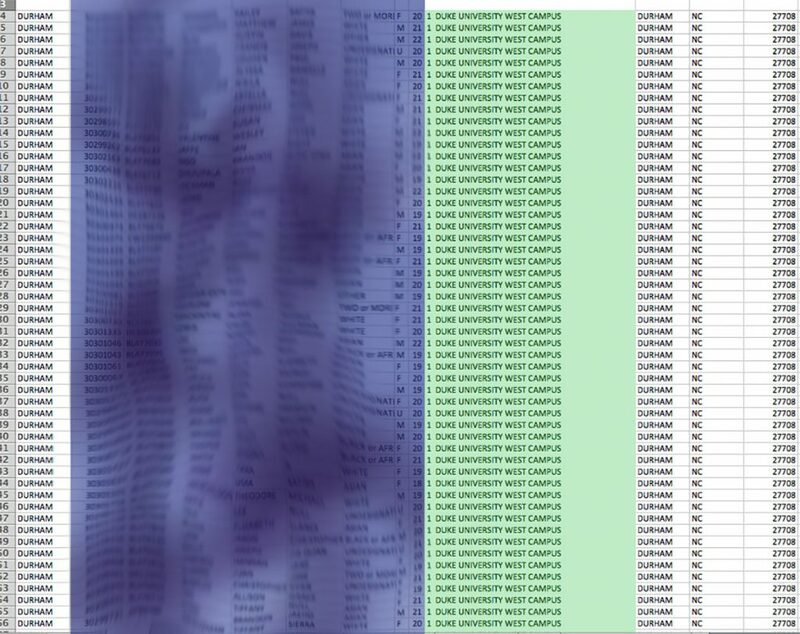 We found that at least 60% of the names linked to a social account that identified the students as from another state. Believing the Duke results may just be an anomaly, we looked at the data for other college campuses in both Durham and Wake counties. We found more than 700 voters were registered at a centralized campus locations and not where they sleep. At North Carolina Central University (NCCU), 340 students were registered to the college’s generic address of 1801 Fayetteville Road, Durham, NC. Taking into consideration the definition of residence, it would appear that all of these voters mentioned in this article did not meet the voter residency requirements and subsequently voted without a valid registration. State Statutes for Voter Residency were recodified after this article was printed. The fuller version can be viewed at the NCGA website, however, the revised version still does not allow for the types of registrations reported in this article. The State Board of Elections was questioned on the matter and it was revealed that colleges were given a special dispensation from that statute which every other resident in the state is required to adhere to. This entry was posted in Am Lens, ELECTIONS, POLITICS NC, Uncategorized and tagged Carolina Chaos, North Carolina, Voter Residency. Bookmark the permalink.